The vast majority of online visitors to law firm websites -- 82% -- used a form to make contact with a law firm the first time they landed on their website. Just about 10 percent decided to wait until their second visit before making any inquiries. To find out how many times a visitor visited a law firm's website before contacting them, Custom Legal Marketing, examined 70,000 leads from various practice areas in multiple cities across the U. S.
The leads examined were only those that filled out online contact forms and were considered to be unique visitors. A visitor could make additional visits, but they were not counted (for this report) until they had left the website for at least half an hour before returning. The study also shows that only 3 percent of website contact leads decided to contact a law firm after their third visit, while 1.3 percent felt that four to five visits were best before making any decisions. About 1 percent opted to continue researching and return six to eight times before filling out a contact form and 1.7 percent visited between nine and 100 times before filling out a form. Analytics like this are vital to a law firm's marketing strategy to assist them in understanding how their firm gets leads, where they come from, how often they visit and how long it takes to fill out an online contact form. With the main focus being contact-to-client conversion, and anticipating long-term sustainable results, it is important to know how a website is performing and analyze what other contact methods may increase leads, such as click-to-call capabilities for mobile users. 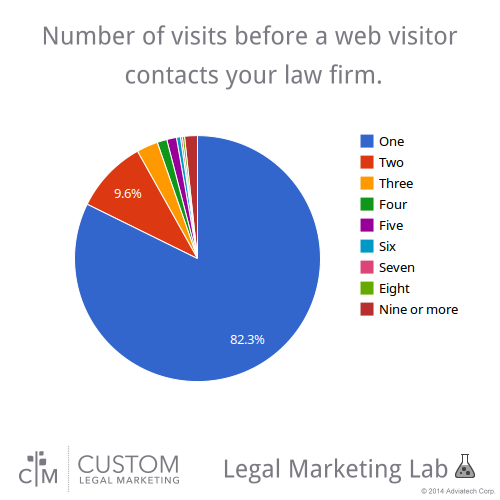 Read the full report at the Legal Marketing Lab at http://www.customlegalmarketing.com/lab/how-many-visits-does-it-take-to-convert-a-visitor/.